The species is widespread on southern heathlands, but very scattered elsewhere in Britain, north to Scotland. It is widespread in north-western and central Europe. Wet heathland, wet woodland, bogs. The main habitat of D. fimbriatus is Sphagnum bogs and pools, although juveniles may be found in much drier habitats away from bogs. 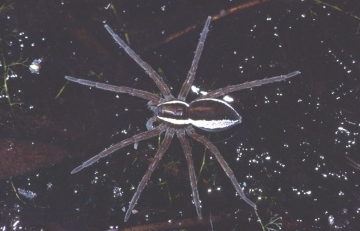 The spider also inhabits water margins of ditches, ponds and slow flowing streams. Adults assume a hunting position on emergent water plants where the front appendages are held on the water surface. In this position the spider preys on invertebrates trapped on the water surface. When threatened the spider retreats underwater. Spiderlings hunt in high vegetation. Adults are found in spring and early summer. Females carry their spherical egg-sacs in their chelicerae and enclose them within a nursery web prior to spiderling emergence. Very local, recorded in 45 hectads since 1992, but the spider may be not infrequent on some wet southern heathlands. No apparent decline. The main threats are destruction of heathland for housing development and agriculture and the drainage of wetlands. Protect heathland sites from destruction and ensure the water-table of wetlands is maintained.